Jeffersonville, Ind.-based Spyker and parent Brinly-Hardy Co. released its new ERGO-PRO series spreaders. The ERGO-PRO series is offered in 50-, 80- and 100-pound spreader capacities. The ERGO-PRO series showcases a new hopper geometry that virtually eliminates bridging, allowing all materials to flow to empty, the company said. Fewer stops are required with a fill-to-level resting angle and a stability-improved support stand that fits rear platform carriers. The triangulated double handle is both bolted and welded to reduce the force required on turns (no flex), and captures a spring-loaded open-close lever with positive shut off for zero material waste. The handle adjusts to fit operators from 5 feet 3 inches tall to 6 feet 6 inches tall. Additional durability is achieved through Spyker’s lifetime warranty all-metal gears and the largest, impact-tested welded frame in the industry. 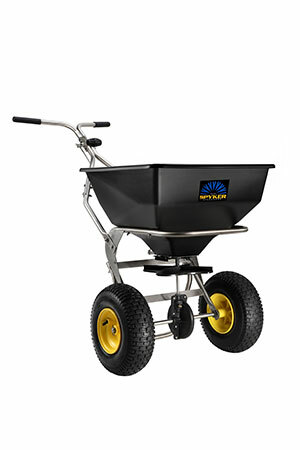 Spyker has also released the Spyker ICE, a 100-pound stainless steel frame spreader specifically designed for winter use with ice melt and rock salt—including bulk rock salt. This model includes a stainless-steel carving blade and high-visibility frame features.